I recently made the mistake of wandering into the San Luis Obispo Tourism Office. I wasn’t trying to go there, you understand. But it was Hump Day, or whatever it is you call a day when you don’t want to go to work so you toss back a few martini olives and stage a scavenger hunt in which you and your friends see how many benches you can get kicked off in downtown SLO. While I was ducking the fuzz, I happened into the nearest open door. Where I was promptly handed a smiley face T-shirt, my cheeks were stamped with dimples, I was asked if I’d ever been affiliated with the Communist Party, and bedecked in twinkle lights. It was a lot like being in a spa, if the employees took hits off the bath salts and demanded that everyone around them be happy. I made a few friends, though. As soon as they realized that I know more than one word for “happy” they offered me a job and put me in charge of promotions. So this is a formal notice that there’s going to be some changes. These changes might not be agreeable to those of you who thought it made sense to put privately funded works of public art in a guillotine. But to the other, rational, segments of the community, I think my work will be appreciated. In the first place, I’m tired of my Facebook events consisting solely of rallies to save various beautiful works of art. (Sidenote: would someone, please, just invite me to their party? I’ll bring homemade cheese and crackers.) Besides the Rally to Save the Bike Arch there’s now a Rally to Save the Tree Mural in Atascadero at The Artery, which was apparently denied a permit from the Atascadero Design Committee. To which I respond: Have you seen your city, design committee? You really shouldn’t have chosen such a high horse for yourself. Consider yourself blessed to have a business that’s paying out of its own pocket to beautify your city rather than littering it with trashy billboards. And a mural of a tree, for heaven’s sake! I know trees are something of a risqué subject matter—they are naked, after all, and not everybody is pro-tree. But the tree in question, despite not being properly attired, is still pretty inoffensive. If you don’t believe me, for reference you can check out the mural at The Artery. At least you could if you weren’t trying to get it torn down. This is a point I’ve made in the past, but apparently you’ve got more wax in your ears than the people supporting the Morro Bay Aquarium, and I speak to all cities here: You don’t create character by the quality of your sidewalks—however much you pay for them—and the simple fact of your tourism board telling the world how happy, how friendly, how vibrant, how colorful your town is doesn’t make it so. To create and sustain a culturally and artistically vibrant community, you need a public that’s engaged and creative and vocal. And yet, all I keep hearing, again and again, are stories of local governments squashing those expressions of creativity like an unwanted bug on their fancy sidewalks. It’s not just murals and sculptures. Let’s consider the fact that a kid writing messages to his deceased friends on an empty billboard to help cheer up their families is considered a criminal. Yes, we have laws. But who are they protecting? I was a lot happier driving past that lot when it had loving and very personal messages from one friend to another than, say, the giant billboards advertising law firms and adult novelty toys. And personally, I’d like to think that those personal messages were a better reflection of this community, this supposedly happy, supposedly friendly community. But that’s not entirely true, either. Dalidio wanted to develop. And the voters—and by voters, I mean the Copelands and Downtown Association, which wanted all the money-grubbing box stores and secretly but not-so-secretly fiendishly campaigned against the development—said no. They flexed their muscles as involved citizens and issued a very particular opinion about the city’s identity. And I don’t necessarily think that the voters who didn’t want some tarted up chain store cluttering up their pastoral views would really be all that distraught by a simple, inoffensive line of text proclaiming love. I know it’s hard, for some reason, for city bureaucrats to believe that they’ll ever top the whole “happiest city” proclamation. They still haven’t stopped wetting their pants with glee every time they hear the word. But it may be time to start considering other ways to showcase this community. Like, say, encouraging citizens to make and share artwork that they consider important. Without hundreds of dollars in permitting fees. Be the city that has the only billboard in the world that’s not about selling something. Maybe that’s just not possible. But why would you listen to some guy who doesn’t even live here just because he happened to write a book—which, let’s be honest, you don’t read unless they have an Oprah stamp on them anyway—over the opinions of people who actually live in your community? Shredder’s bailing for a county that’s less insulated. 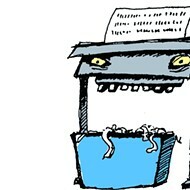 Send postcards to shredder@newtimesslo.com.